Big Poppa Eats: More Quick Hits! Restaurant week. I wasn't sure I would be partaking in Restaurant Week this year but as luck would have it I had two good meals in the first two days of RW 2012. The lovely folks at TheDailyMeal.com took me to lunch and we ended up at Periyali. Periyali is a wonderful Greek Restaurant on West 20th Street. It has been in business for almost 25 years and it has not lost a step. Periyali is one of those restaurants who's name elicits a smile and fond memory from everyone who has ever been there. When you tell a friend that you just ate at Periyali the response is always the same;" Oh, Periyali! I love Periyali." That is usually followed by a memory of a birthday dinner there, a party for a family member or a romantic night. It is one of those rare restaurants that has survived by serving great food with great service in a beautiful setting. This is a restaurant for adults, and I mean that in the best way. The room is long and elegant, with white walls and light blue and silver touches that evoke memories of a sun drenched Greek Isle. The service is professional and welcoming. The food doesn't disappoint. We went to Periyali on a whim and it turned out they were participating in restaurant week. I went with the restaurant week menu. My starter was a classic plate of mezze. The plate consisted of Taramosalata (caviar mousse), Melitzanosalata (grilled eggplant puree) and Tzatziki (cucumber with yogurt and dill). If you love Greek Mezze, you will love Periyali's. For my main course I went with Kotopoulo Foumou. Roasted free range chicken with oregano and lemon potatoes. For whatever reason I tend not to order chicken in restaurants unless it is fried chicken. Maybe it is because I have read too many times that chefs hate having chicken on the menu (they find it boring) but the customers insist. Regardless, on this day I ordered the chicken and it was the right call. The chicken itself was top notch, plump and full of flavor. Perfectly roasted so that the meat stayed moist and juicy, it was bathed in a lemon-oregano sauce that was tangy and delicious. I am re-thinking my "no chicken" policy. Kotopoulo Foumou warrants a return to Periyali. A nice plate of sweets and an espresso later, I walked out of Periyali with a smile on my face. I know when someone mentions "Periyali" to me in the future that smile will return. For my second meal I was joined by my dear friend Ben. We have been restaurant week partners for a long time, but when the last round came he passed. He was on a health kick and was staying away from long, leisurely meals. So I was pleasantly surprised when we made a plan for lunch and he suggested hitting a restaurant week spot. After surveying our options we decided on The Dutch. I will be honest, I had been avoiding The Dutch. The hype and scene kept me away. There are too many other great restaurants in New York. I was surprised to see them participating in Restaurant Week and was more surprised when we were able to get a reservation for the time we wanted. I was asked if we would be participating in their Restaurant Week menu. I said yes and I was worried we would be shuttled to some remote corner where the Restaurant Week people would be out of eyesight of the regular patrons. I am happy to report this was far from the case. The Dutch sits on the corner of Sullivan and Prince. It is a handsome place. The front room has big windows, lots of wood, a tiled floor and a bar with green tiles, a light wood top and brass fixtures. All this gives The Dutch that modern "old time" feel. A hallway leads to a large back room. This is no purgatory. It has a slightly more casual, comfortable feel than the front room. The staff was friendly and enthusiastic. We were given the option of both the regular menu and the Restaurant Week menu. We went Restaurant Week, with a supplement. We opened up with a few Oysters. Wellfleets and Island Creeks. They were cool, fresh and delicious. We then hit the Restaurant Week menu. First up were the appetizers. 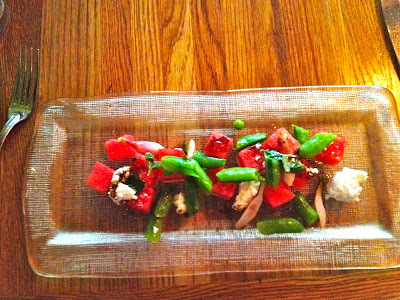 I started with the Watermelon Salad with Sugar Snap Peas and handmade Sheep's Milk Ricotta. I love a good watermelon salad. The addition of the snap peas was an interesting one. Eaten together, the snap peas and watermelon didn't really work, but eaten separately, with some of the ricotta, the watermelon and snap peas were a great contrast. The watermelon was soft and sweet in one bite, the peas crisp and sharp in another. A great summer time salad. Ben went with the White Gazpacho with Ruby Red Shrimp and Marcona Almonds. The soup was not a traditional gazpacho. There were elements of tomato in the soup, but it was creamier (almond milk I believe) and smoother. Each bite brought forth different flavors. Sharp tomato in one spoonful, cool almond in another, a chewy, sweet bite of shrimp in a third. The soup leaned a bit towards the bland side, but it was unique enough not to be disappointing. It was time for the main events, and I went with the Orecchiette with Benton's Bacon, Sweet Corn and Sungold Tomatoes. The Dutch is a restaurant who embraces seasonal cooking . 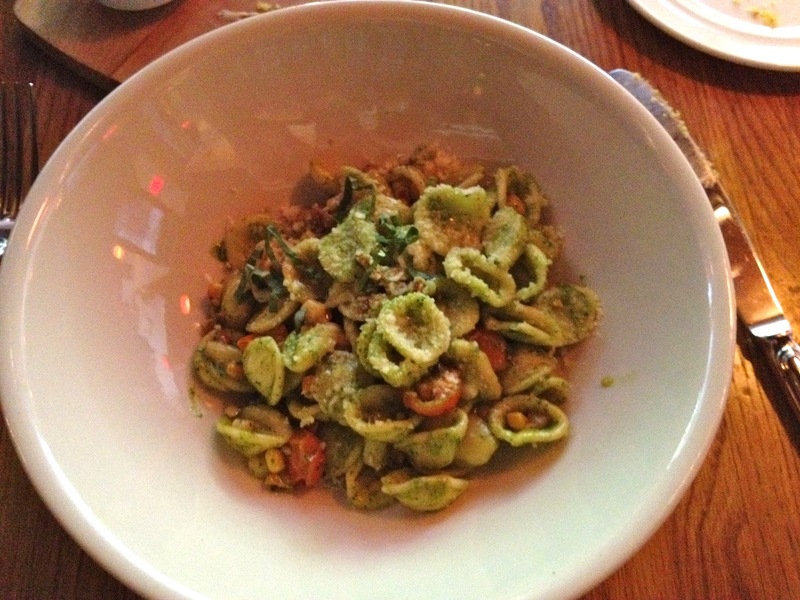 The orecchiette had a delicious light pesto on it. Again, each bite brought a contrast. One bite featured the smokey bacon, the next the sweet corn then a bright, tart tomato. This is what seasonal cooking is all about. I loved it. Ben had the Steamed Halibut with Quinoa, Local Beets and Horseradish. Sounds healthy, maybe boring. Nope. The halibut was delicate and delectable, the quinoa earthy and chewy. Pickled beets and horseradish sauce brought it all home. Healthy? Probably. Tasty, definitely. Dessert. No afterthought. First up, Ben's. Peach Melba Sundae. I couldn't stop him. Peach sorbet. Vanilla Ice Cream. Cake. Raspberries. Sweet summer goodness. You get the picture. Me, Chocolate Semifreddo, Rocky Road. There is something you should know about me . I don't love marshmallow. Outside of s'mores I never eat them and Rocky Road has never been my ice cream of choice. Now that you know that let me say, wow. This was probably the highlight of my meal. This dessert was essentially deconstructed Rocky Road. A tower of chocolate semifreddo was rich and smooth, somewhere between gelato and a frozen mousse. A heavenly, berry flavored marshmallow sauce formed a moat on one side of the tower. The whole dish was sprinkled with chopped, candied almonds. Add this to the list of my favorite desserts. Lesson learned. Don't believe, or be turned off by the hype. The Dutch was a delight. I can't wait to try it for dinner. I hope they will still have the semifreddo. Since Perl 6 is multi-threaded in its core, it was decided at a very early stage that reference counting would be problematic performance-wise and maintenance-wise. Instead, objects are evicted from memory when more memory is needed and the object can be safely removed."